Tostadas are a staple of basic Mexican Food. Not only are they delicious, but like many other recipes, they are not complicated to make either. Like my mom says, the secret is in the seasoning, and I agree with her 100%, because even the most simple meal can be exquisite when it is made with love. One of the common themes of Mexican Food is using fresh ingredients, and this recipe is no exception. Regardless of what type of tostada you make – Steak, Chicken, or Ground Beef – they always will have similar ingredients – the difference is in how you prepare the meat. It’s important to have a good salsa to accompany it – because a good salsa can enhance any Mexican food. Now, let me correct you if you are thinking that “la tinga” is one of those “strange” meats that some people eat in Mexico (like Menudo, for example). Trust me, if it was, my husband would not eat it. He really isn’t a fan of some of the more exotic meats, so I have to stick to the basics with him. 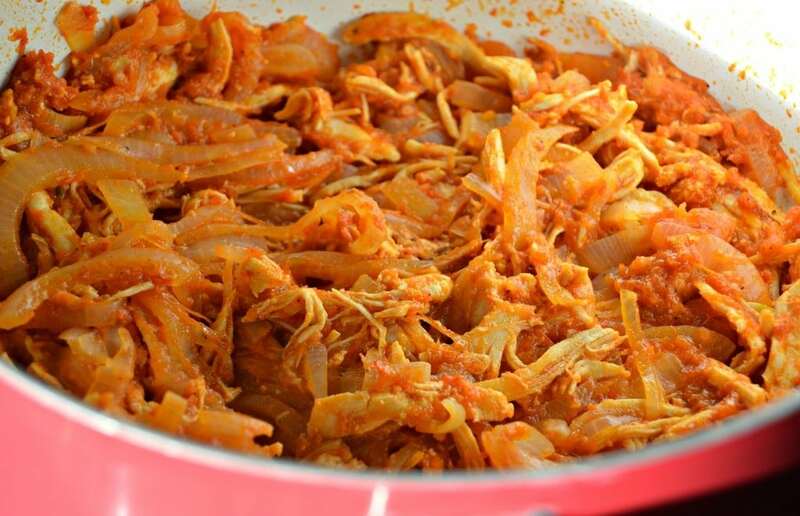 In this case, “Tinga” is the name of this specific way of preparing the chicken with various spices, onions, and salsas. 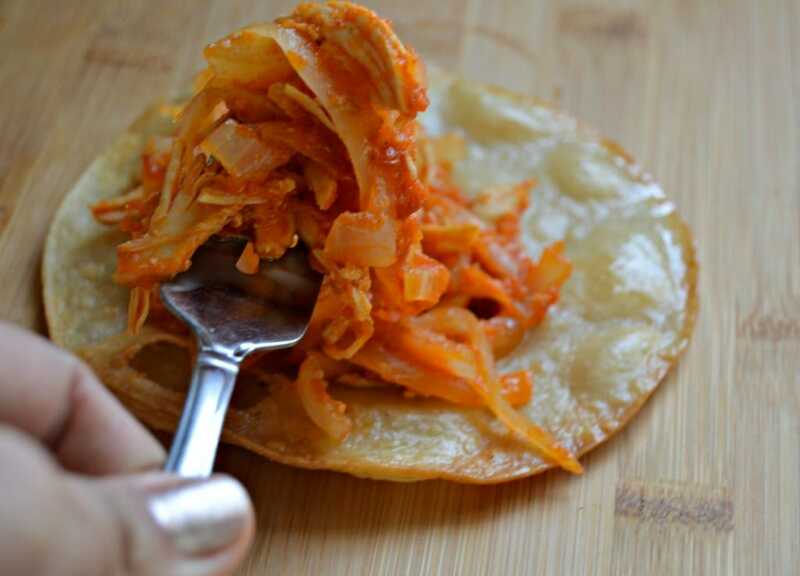 This type of tostada is very popular in central Mexico and it is so easy to make! 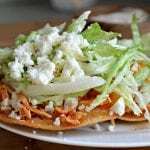 I am sure that you will love this, so go ahead and try this different version of the famous Mexican Tostadas! This version of the recipe originated in Puebla state, which is very close to Mexico City. It is an irresistible dish that is enjoyed year round, but especially during the patriotic Mexican holidays when people are eating other delicious foods like tacos, flautas, and tamales to mention a few. 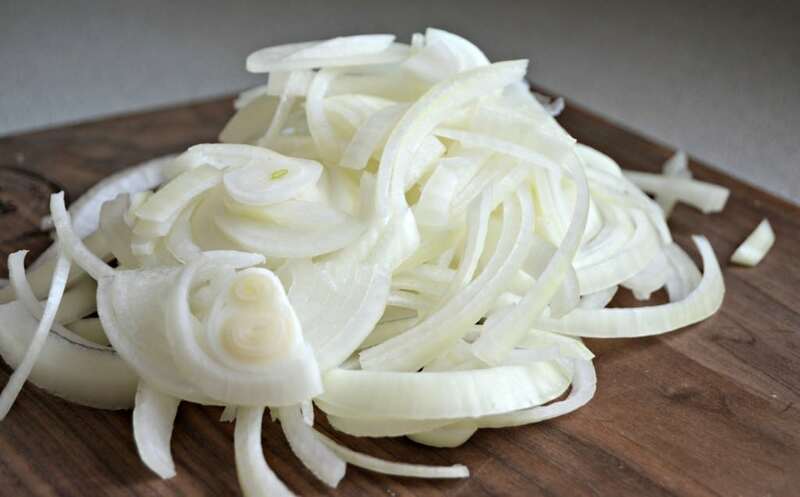 It is very simple to make – all you have to do is slice a large onion and saute it, then you mix it with shredded chicken and a special sauce made with fresh tomatoes and chipotles in adobo sauce. 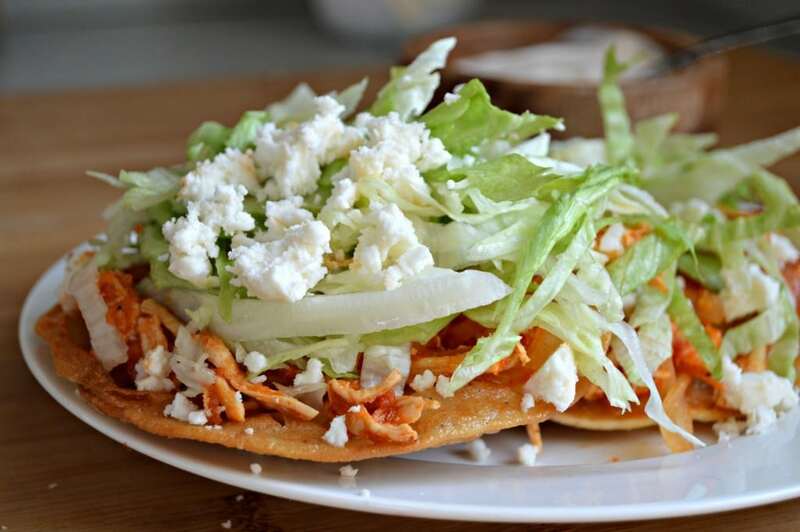 To form the tostadas, you start by adding some of the chicken mixture over a fried (or baked) tortillas, and then top with lettuce, cheese, and cream. The main difference between this and other tostadas is that it does not include beans. The delicious chipotle flavor makes this meal even better. Saute the onions until they are transparent. 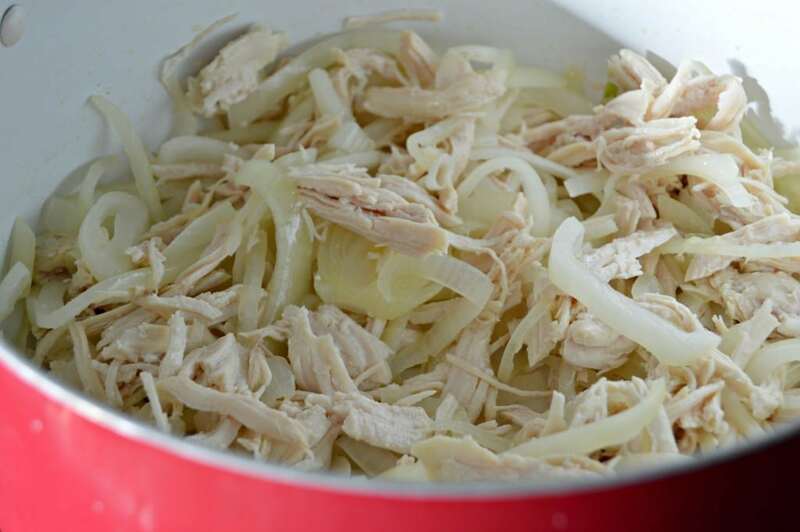 Add the shredded chicken, and cook for a few minutes. 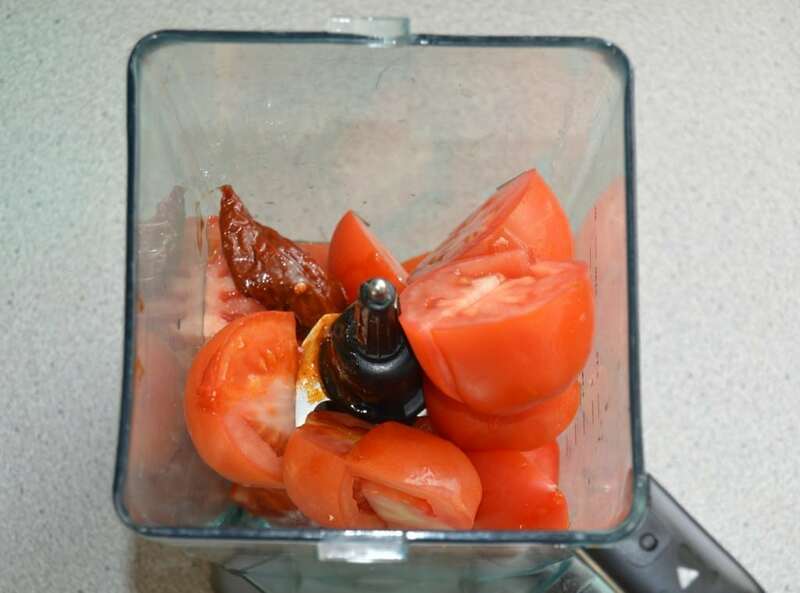 Blend the garlic, tomatoes, chicken bouillon, and chipotle in a blender and add to the meat mixture. Cook for 20 additional minutes or until the liquid has evaporated almost completely. 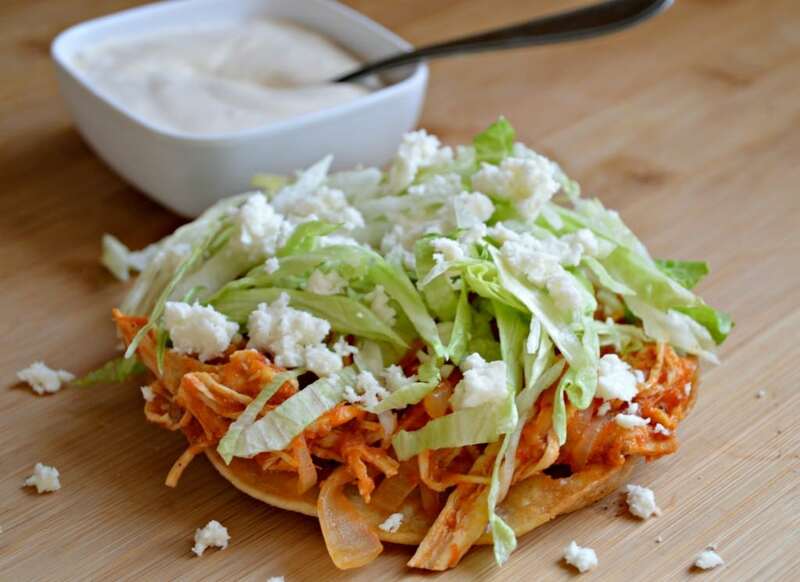 Put the chicken mixture on a fried or baked tostada and top with lettuce, cream, and cheese. Tostadas are so delicious, but I’ve never tried them at home. I want to now, though! OMG, i know you mentioned the spiciness of the chipotle in your post but the importance didn’t come across to me. This was severely spicy!! Adding water to balance it just messed it up. I had to toss the whole thing out. I’d like to do it again but use only one chipotle maybe. IDK. But I am anxious to try it again. Teresa, I have learned to always, always start with maybe a quarter of the chile called for in the recipe. Then I give it a quick taste and add more until it is just right. Chiles vary so much. One day I need to use a whole jalapeño in salsa, and the next week I’ll get a new one from the store and need to completely deseed and devein and use only an 8th in the very same recipe! Very good. I was using a much more complicated recipe but this was simple and delicious! This is my go to Tinga recipe. Very simple and delicious. Even my 11 month old son likes it. Thanks! Thanks, Amber! I’m so glad that you enjoy this recipe. Does the recipe call for a tbsp or tsp of chicken bullion? Hi Bee – it should be 1 Tablespoon. Sorry about the confusion – I will update the recipe to clearly show Tbsp. Thanks! Thank you. Making this for dinner tonight. The best option is probably just to use the adobo sauce that the chipotle comes in, without adding any of the actual chipotle. That will still get you the flavor without as much heat. Hey I love all your recipes!! I was just wondering if you could post serving sizes and also when adding the peppers in Adobo sauce I don’t know how many to add that would make a medium spiciness . thanks for sharing all you have! I just updated the recipe to show approximate serving sizes. It may vary a bit depending on how much chicken you add to each tostada. For the chipotles, it is hard to say because it often varies by the can. I would say to start with one and go from there adding about half a chipotle until it reaches the desired level of spiciness. 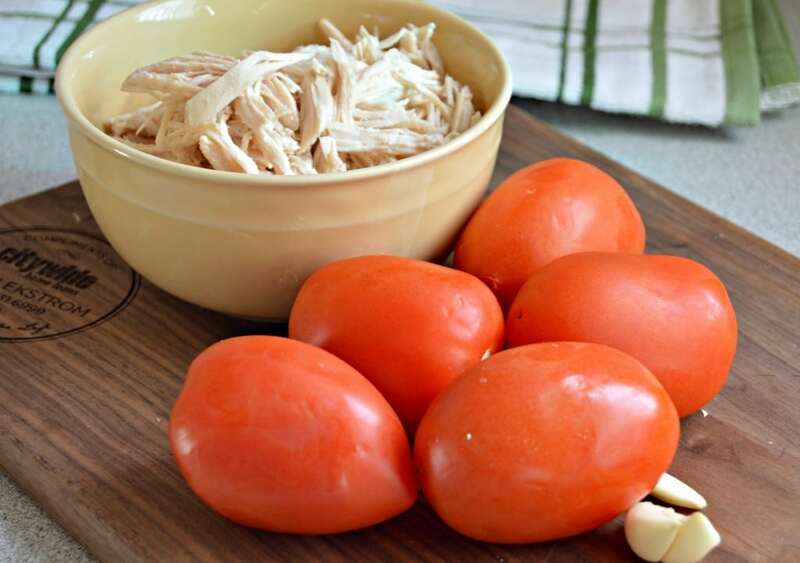 Yes, you will blend the tomatoes with the garlic, chicken bouillion and chipotle peppers. Good luck. I love this recipe. I have made it a couple of times, and I am going to make it again this week. I love how simple it is. The chipotle gives the chicken such a great, smoky flavor. Thanks, Elizabeth! I am so glad that you enjoy it! In future recipes would you please add your name and the name of the recipe to photos? When I’m searching through saved recipes I want to be sure it’s YOUR recipe I make. Thanksabunch! !